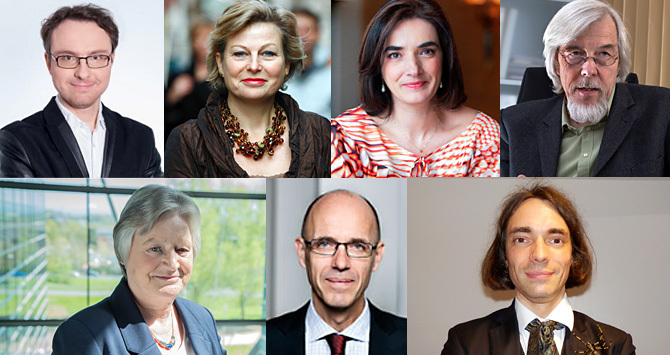 Seven top research scientists are to provide scientific advice to the EU Commission in the future, thus assuming the role of the former “Chief Scientific Adviser”. How should the committee work? And how independent can it be? Commentary by Annika Thies, Director of the Brussels Helmholtz Office. Brussels now has a new venerable committee since last week – a “council of wise men”, staffed with European top research scientists. Expectations are high: This seven-scientist “High Level Group” shall design the scientific policy consultancy for the Commission, thus “contributing to the quality of EU legislation” as a part of a larger "Scientific Advice Mechanism" (SAM). A total of 162 scientists had applied for the committee; out of this group three women and four men were selected – their subject areas span from sociology to molecular biology to particle physics (see box). In reference to consultation, the question inevitably arises regarding the degree of autonomy. This is to be a unique selling point for the High Level Group, since – and this has to be emphasised – the EU has, by all means, internal scientific services as well. Despite the close connection to the Commission, the group is meant to act exclusively in the public interest. This does not work out with absolute independence: Since October there is a department in the Commission’s Directorate-General for Research and Innovation that has been designated SAM. It comprises, more or less, their Secretariat and the Commission staff should provide support both administratively as well as technically. And there is a lot to do: the Commission department is already busy, for example, with the task of finding topics for which there could be a need for consultation, as well as collecting and prioritising proposals from the other Commission Directorates General. This High-Level-Group should bring in the scientific point of view here, and in cases of doubt they must also get involved themselves and draft short reports or position statements regarding the topics they have prioritised. To what degree independence can be achieved there will have to be seen. However, one can by all means have confidence in the established research personalities as regards self-reliance and, if need be, stamina when they get down to work starting January 2016. An additional challenge in this regard will be to develop and bundle the expertise in Europe. The enormous body of knowledge within the numerous academies throughout Europe will be highly relevant here. Moreover, the research facilities also have crucial expertise at their disposal in scientifically-oriented policy consultation, which can be equally referred to – and should be! Establishment of a functioning system here that accesses the respectively best reports and experts is a task that requires considerable overview and experience. The High Level Group thus has the opportunity to make provisions for better influence of scientific expertise at key points in EU policies. Seven is supposedly the best number, according to the Commission – powerful and at the same time sufficiently diverse. Yes, it is really gratifying to see that the Commission was in fact able to resist the not-so-atypical urge to install a committee consisting of 28 members (corresponding to the number of EU Member States, which is the case for the Commission departments). With the designation of the High Level Group, finally and luckily, the tiresome discussions are at last finished concerning whether or not the Commission could possibly have something against scientific consultation. Again and again this suspicious topic appeared ever since the contract for the previous "Chief Scientific Adviser", Professor Anne Glover, was not extended. An eviction, a dismissal? Of course, this was still not a healthy signal within the first few months of tenure for the newly acceded Commission President Juncker. But it also did not represent a rejection of advice from the scientific sector per se. On the contrary, since one thing is clear: Concerning the work-load requested by one of the High Level Group members amounting to 40 – and for chairmen 60 – days per year, for the commission it is all about an expected output that might just surpass the dimension of a fig leaf – representing for the seven more than a purely prestigious job. Good luck! The High Level Group is part of the Scientific Advice Mechanism (SAM), initiated in May 2015, which is supposed to re-design the EU Commission’s scientific policy consultancy and improve the quality of information. SAM should primarily make use of the expertise of national academies for this purpose. They shall receive 6 million euros, particularly for setting up suitable structures for these tasks. The SAM Secretariat is located in the Directorate-General Research and Innovation of the EU Commission. After a time span of only three years, SAM shall replace the position of Chief Scientific Adviser installed by the former Commission President Barroso.